The only oral anabolic-androgenic steroid indicated in the treatment of anemias caused by deficient red cell production. Androlic is contraindicated in: male patients with carcinoma of the prostate or breast; females with hypercalcemia with carcinoma of the breast; women who are or may become pregnant; patients with nephrosis or the nephrotic phase of nephritis; patients with hypersensitivity to the drug or with severe hepatic dysfunction. 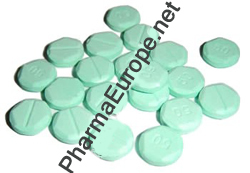 Tablets are green hexagon shaped tablets, with "50" imprinted on one side a score line on the reverse, sealed in bags of 100 tablets.